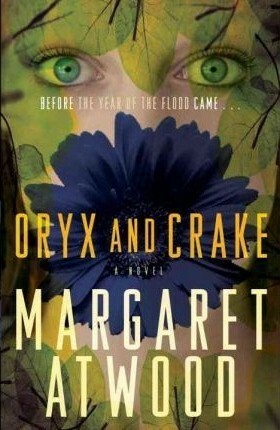 Oryx and Crake by Margaret Atwood is an incredible dystopia; or more accurately, an incredible post-apocalyptic sci-fi dystopia. The reason it’s both post-apocalyptic and dystopian is because the main character is living in a post-apocalyptic world and reflecting on the dystopian society in which he once lived. The world that Atwood builds is fascinating and terrifying at the same time. Well, the world that was; the one before the apocalypse. The story starts off with Snowman waking up in a post-apocalyptic world, and interacting with a new breed of humans, the Children of Crake. Through Snowman’s recollections we gradually learn the sequence of events leading up to the collapse of civilization, the creation of the Children of Crake, and Snowman’s place in all of it. Snowman reminisces about a world in which there is extreme social disparity, genetic hybrids, corporations which have taken over society, and man-made viruses run rampant. And since corporations are the government, anything is legal as long as they get their cut. Atwood has never failed to horrify me… in a good way, a self-progressive way. Her command of the English language is something to be admired. What I love about Oryx and Crake and the other books of hers I’ve read (The Handmaid’s Tale, The Year of the Flood) is that they aren’t just sci-fi books, they’re deeply philosophical works of fiction that raise some important questions that really make you think. I think the most horrifying aspect of Oryx and Crake is that it may seem far-fetched, but it’s really not. This book is too relevant for my comfort. There’s more to Oryx and Crake than just the philosophical side. It’s also about friendship, betrayal, loss and loneliness. There’s even a love triangle. Not one as dramatic as Bella, Edward, and Jacob’s, but it’s there. The ending of Oryx and Crake is uncertain, definitely a cliffhanger. Fortunately, there’s a sequel, The Year of the Flood by Margaret Atwood, which answers A LOT of questions left unanswered. Unfortunately, that one ends with a cliffhanger as well because it turns out that it’s supposed to be a trilogy. But the third one isn’t out yet! I’m just going to crawl in bed and cry myself to sleep now. I would definitely recommend this book to people who don’t mind feeling uneasy, and who enjoy the sci-fi, dystopian, post-apocalyptic genres; for Atwood fans, and for anyone who is up for an awesome cerebral read. About Guest Diva Sarah: I’m a 21-year-old literature student living off of vegan sloppy joes. Dystopia is my absolute favorite genre so I’m really excited to be a Guest Diva. Aside from receiving an award for doing a superawesome job in my high school economics class, my greatest achievement to date is coming up with an extensive zombie survival plan. That means if you somehow find yourself in my apartment you will see a backpack full of survival supplies and a tomahawk axe sitting next to it.